Portraits of rugby legends created by Gloucester customer Russell Haines are now being featured around Gloucester ahead of the Rugby World Cup. Our resident artist at Moreland's Trading Estate in Gloucester, Russell Haines, has taken on his biggest art exhibition to date in celebration of the forthcoming Rugby World Cup and Gloucester's role as a host city for the sporting festival. Local and international rugby legends, past and present, have been immortalised with a collection of striking portraits. These will be featured around Gloucester ahead of the Rugby World Cup. 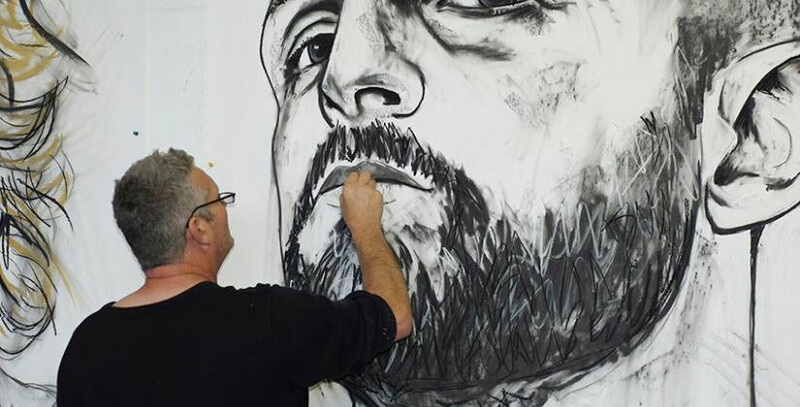 There will be 120 of Russell’s charcoal drawings and colourful oil paintings showcased in venues across the City including the City Museum, Eastgate Shopping Centre, Gloucester Quays and the Guildhall between now and the end of October. Commencing on the project Russell says: "The exhibition is the accumulation of several months’ work. It's been an incredible experience. I've met some very interesting people and faces over the last 18 months. It's been fantastic to be able to invite some of these much-loved and well-known sporting heroes into the studio space here at Morelands and meet with them face to face. "I wanted to do something that hadn't been done before on such a large scale. Gloucester is known for its rugby but not so much its art. By using these sporting legends as the inspiration for the exhibition I'm hoping it will appeal to a wide audience." Portraits are on sale now and a selection of the paintings will be auctioned off for charity at the end of the tour. Russell is also working with students from Gloucestershire's specialist education college, the National Star College, who will be making prints of all the artwork to raise funds. Russell took up studio space at Morelands Trading Estate two years ago for his start-up business That White Space. During this time he has expanded the size of his business unit twice to accommodate his growing success as an artist. Business Centre Manager Jackie Houslop says: "Russell is a very well respected and much loved member of the local community and we feel very privileged to have him in the business centre. He has created a real community hub in his studio holding regular art therapy sessions, as well as art and craft groups for people with learning difficulties. And there's been a real buzz about the centre over the last few months with so many sporting greats coming in and out of the studio." Russell's WOW rugby exhibition is running now until the end of October. Morelands Trading Estate features a range of business space for rent, including industrial units, meeting rooms, office space and workshops. For more information contact Jackie Houslop on 01452 311 421.